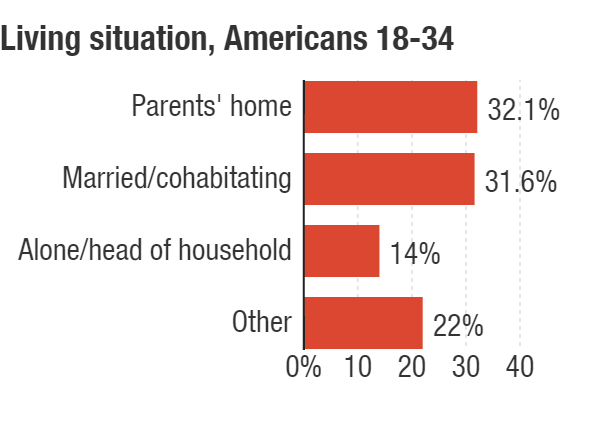 For First Time In 130 Years, More Young Adults Live With Parents Than With Partners : The Two-Way Living with Mom and/or Dad is more popular than any other form of living arrangement among Americans ages 18-34, the Pew Research Center says. Men, African-Americans, Hispanics and less educated young people are particularly likely to live with their parents. But across all demographics, more and more people are living with Mom and Dad, Pew found. For the first time in more than 130 years, Americans ages 18-34 are more likely to live with their parents than in any other living situation, according to a new analysis by the Pew Research Center. 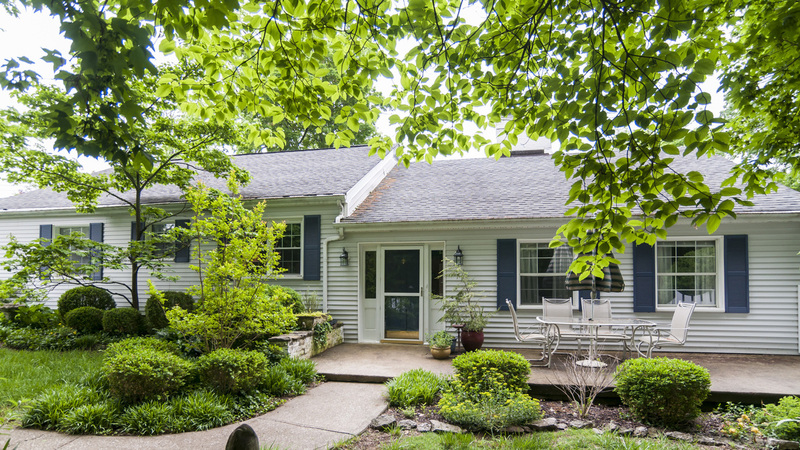 In that age group, 32.1 percent of people live in their parents' house, while 31.6 live with a spouse or partner in their own homes and 14 percent live alone, as single parents or in a home with roommates or renters. The rest live with another family member, a nonfamily member or in group-living situations such as a college dorm or prison. But back then, living with a spouse or partner was even more popular than that. Today not so: More people choose an alternative living situation, and out of the crowded field of choices, life with Mom and/or Dad has become the top pick for millennials. American men ages 18-34 live with their parents 35 percent of the time, and with a spouse or partner 28 percent of the time. For women, the numbers are nearly reversed; 35 percent live with a partner, while 29 percent live with their parents. Less educated young adults are also more likely to live with their parents than are their college-educated counterparts — no surprise, Pew notes, given the financial prospects in today's economy. For black people in particular, the "new" milestone isn't so new at all. Black young adults have been more likely to live with their parents than in any other situation since 1980. Today, 36 percent of black millennials live with their parents, while 17 percent live with a spouse or partner. Meanwhile, taken as a whole, women, white people, Asian/Pacific Islanders and people with bachelor's degrees are still more likely to live with spouses or partners than with their parents. For many millennials, Pew's conclusions might seem both unsurprising and easy to explain: The Great Recession happened, of course! But the rise in the number of young adults living at home started before the economic crash — and so did the possible contributing factors. Male unemployment has been on the rise for decades, Pew says. Even those who have jobs are making less than they would have in their parents' day — for young men, Pew notes, inflation-adjusted wages have been falling since 1970. In general, the study shows how dramatically the living situations of 18- to 34-year-olds have changed since 1880, when the data begin. Living alone, as a single parent, or with roommates — once a rarity — is now the choice of 14 percent of people in that age group. And a full 25 percent of young men are now living with other family, nonfamily or group quarters. Male prosperity rose steadily, and more and more men left the nest — until the '60s and '70s, when wages started to drop and more men stayed home. And women? For decades women who worked were more likely to live with their parents than with a partner or spouse — because wives were discouraged from having jobs, per Pew's straightforward interpretation. But now more and more young women have jobs, and it's unemployed women who are more likely to live with their parents. And yet, even as female prosperity rose, so did the number of young women living at home. Pew speculated it might because of men's lower earnings keeping women from marrying and moving out. Seem plausible? The question might make for a fruitful conversation in households across America tonight ... just ask Mom to pass the peas and the theories.